He is one of the focal points in the Valiant Universe, and now Toyo Harada gets his own, well-deserved series with The Life and Death of Toyo Harada. Toyo Harada was born in Hiroshima, 1936. Just a few years later, in 1941, Japan declares war on the United States and the allied forces. So at a young age, Toyo faced an inevitable tragedy. His father died in the war, and when the bomb dropped on Hiroshima, he lost his mother. But the young Toyo survived, and such intense exposure to nuclear radiation yielded supernatural powers to this emotionally scarred child. With this power, he now had a limitless ceiling of knowledge, and he put it to use learning all he could about science. And with great knowledge comes great power. Toyo goes from scamming the yakuza and other smaller gangs for resources to becoming the worlds largest threat. The whole world fears the man who knows all and looks to break the chain of command. Toyo is a Japanese robin hood of sorts, with a much more muddled moral code. He intends to take from those who have hoarded the power and resources, and give to those less fortunate. He reaches this goal by any means necessary though, allying with other supernatural beings that no military force could ever imagine to defeat successfully. Until one member thinks Toyo has just become too big for his britches as he launches an elevator into space to retrieve alien technology. This is Angela’s final straw, for she believes Toyo has stretched himself too thin and now puts the entire force at risk of losing it all. Her lack of faith in Toyo leads to her betrayal, divulging his weaknesses to the Anti-Toyo forces. I cannot wait for the second issue. I’m intrigued to see what weakness Toyo even has. Will he see this betrayal coming? Will he be able to protect himself and his vision for an equal world? And most importantly will this snake get a well-deserved beating that I would love to see. We have now seen the life of Toyo, so we can only assume his death is coming up soon. But does his death mean that an equal Earth will be unattainable? There are so many questions that only the next chapter can answer. So pick up your copy of the first issue now and see what you think. Nothing I love more than a cliffhanger and Joshua Dysart tickled this fancy of mine with this edition. Not to mention how well he ties historical event, current times, and a fantasy world of his own so seamlessly. Cafu and Mico Suayan impressed me with the artwork they did, especially with the beginning of the comic. The page layout with the massive explosions, as well as the intense colors, made me almost feel the heat. Terrific comic all around, and as previously stated I’m eagerly awaiting chapter two. 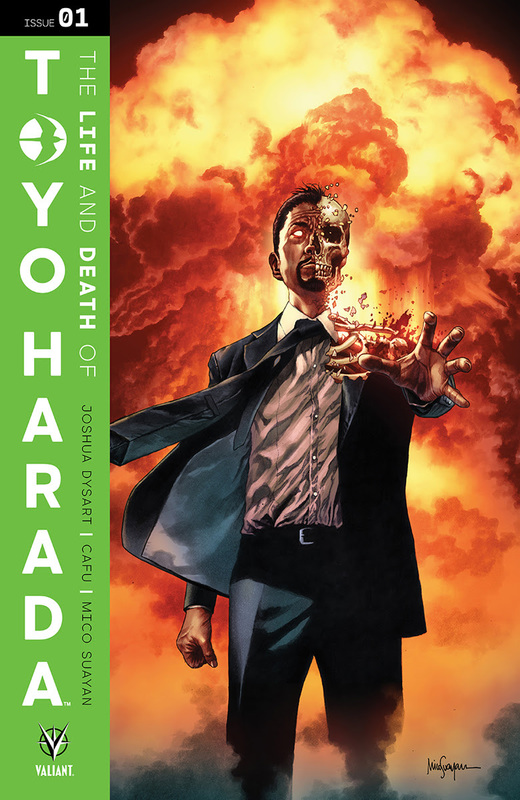 I highly recommend the start to the Life and Death of Toyo Harada. Previous Transformers #1 Review: The Beginning of the End!